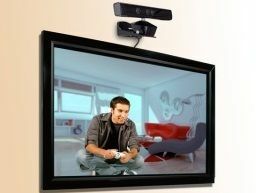 Might we use Kinect games to play with mates on Windows Phone 7 handsets soon? In one of the strangest tech demos of Mobile World Congress 2011 to date, Microsoft has been showing off a tech demo of a Windows Phone 7 working with an Xbox 360 Kinect game. The video, which you can see below, shows Kinect and Windows Phone 7 working in what appears to be a fairly seamless way. Whether this type of gameplay will ever make its way into commercially available games (and how) remains to be seen. For now, we can only imagine this is one of Microsoft's clever tech demos that it is using to wow the crowds at MWC 2011 in Barcelona this week. That said, the idea of effectively controlling a friends movements in his or her lounge as you are sitting comfortably anywhere else while idly stroking your Windows Phone 7 handset does appeal!